The henges are Neolithic and Bronze Age earthworks that were built across Britain between 4,000 and 5,000 years ago. 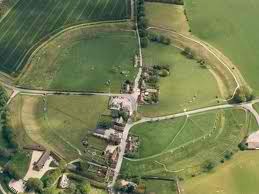 All the henges feature a ring bank and ditch but with the ditch inside the bank rather than outside which would indicate that they were not for defensive purposes. The henges were not occupied but were associated with ritual structures such as stone and timber circles. Henges may contain various internal features, including timber or stone circles, pits or burials, which may pre- or post-date the henge enclosure. Henges and stone circles can exist together or separately. Burials were often located in the areas around the henges, predating or postdating the henges. Most experts (with exceptions, of course) agree that the henges were unique to Britain. The three largest are Avebury (Salisbury Plain in Wiltshire, Stanton Drew stone circles, Ring of Brodgar (Orkney). 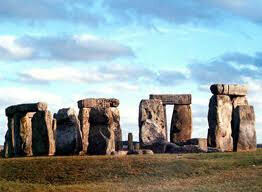 The most famous henge (called a henge even though the ditch is outside the earthwork bank) is Stonehenge. Woodhenge which contained wooden posts rather than stones has been proposed as a place for the living, as opposed to Stonehenge being a place for the dead. Ritual paths and the river Avon connect the two which are within site of each other. There are approximately 100 henges surviving across the British Isles. The construction of the henges vary from a single entrance through a gap in the bank, to two opposing entrances, and the four entrances with two sets of opposing entrances. Orientations (north-south, east-west) of the henges vary, though some of the stones correspond to the soltices. The exact purpose of the henges is believed to be for rituals and astronomical observational. One theory states that the reversal of the bank and ditch design that was traditionally used for defense was that the purpose of the henges was NOT to keep something from getting in but to get something FROM GETTING OUT. WHOA!! Given the lack of contemporary evidence, however, the purposes of the henges are the conjecture of one culture about another culture with a vastly different worldview. Later cultures and groups co-opted the henges for their own ritual purposes. The henges are associated with but were not constructed by the Druids.